Eat, live, travel….. sparkle! | eat. live. travel. write. I have deliberately waited until we are in Laos to schedule this post because I KNOW both my dad and Neil will be saying “What do you need that for?” when they see this…. I had actually forgotten all about it until we emerged from the Town Hall Station of the Queen Victoria building to see the Pandora store right in front of us. 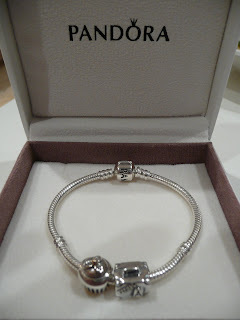 Up close, you can see why I couldn’t resist… A beautiful silver bracelet that is SO me. A cupcake and a suitcase…. How could I not? More to come, hopefully, over time…. 8 Responses to Eat, live, travel….. sparkle! It's so beautiful! I love the suitcase stamped with "Paris" on it…so perfect! I love the little suitcase. I'd want a reel of film, a hershey's kiss, a picture of my daughter and a book, and a scuba tank or fins. Lovely…I love my Pandora bracelet too..I add to it whenever I need a little pick-me-up, and the charms are simply beautiful. I'm more of a Links of London girl but it is tres chic and VERY you!!! I LOVE those!!!! You are mean…now *I* want a Pandora bracelet with food stuff on it.